Ohio group's first major trip in 38 years proves "Norton can!" 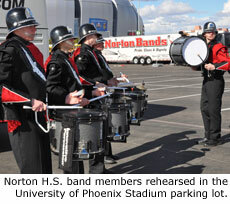 PHOENIX, AZ, December 30, 2010  It's only the second day of a six-day trip to the Fiesta Bowl Parade, but the staff of the Norton (Ohio) High School marching band already feels the trip has been worthwhile. A year of preparing and fundraising has been filled with teamwork, reaching goals and anticipation. And the charter plane ride from Ohio to Arizona  the first-ever plane trip for nearly two-thirds of the band members  was enjoyed like a rollercoaster ride with some students raising their arms during takeoff and landing. 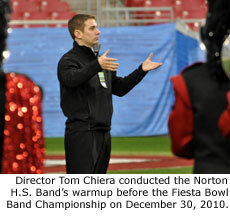 When first pitching the possibility of a major trip, band director Tom Chiera shared the idea that "Norton can!" to anyone who questioned whether the group from a small town in Ohio could raise the funds needed to move the 108-member band across the country. "The first step was just selling the idea that Norton could raise the funds." Initially, drum major Devyn Renninger was among those who needed to be convinced. "At first we thought our director was crazy, because we had no idea how we would get here," Renninger said. Clarinet player Taylor Goch said band members participated in every type of fundraiser imaginable, including car washes, a fruit sale, and a butter braid pastry sale. The efforts paid off, just in time. "We were blessed. We reached our fundraising goal about a week ago," Chiera said thankfully. Chiera said they went over the top with last-minute donations from Norton H.S. alumni and community members who felt the trip was an opportunity the band could not miss. "It was neat to hear former band members and alumni reflect on their experiences," he said. "We received a donation from 94-year-old Winifred Dearth who graduated from Norton in 1943. She wrote us a nice letter and reminded us that she was the woman who wrote the words to our alma mater." Before all the fundraising plans were made, Chiera researched potential trips and examined itineraries from other bands. "Several colleagues that I respect suggested the Fiesta Bowl for our trip, based on the positive experiences they had here with their bands in the past," Chiera said. "I definitely wanted a band trip that involved marching activity, since we take a lot of pride in marching at Norton. The Fiesta Bowl Parade is a good fit and was our first choice." In addition to the Fiesta Bowl Parade, the Norton Band is also presenting its fall field show in the Fiesta Bowl Band Championship. To have the marching band ready for Phoenix, the staff did some strategic planning early in the year. The band participated as usual in Ohio Music Education Associaton contests plus a Bands of America Regional Championship, but they opted to attend events that were close to home to save funds for the big trip. After the regular season ended in October, the band held several community performances including a thank-you concert for donors. The band took a few weeks off from marching to focus on solo and ensemble music, and then had three rehearsals at the state-of-the-art indoor fieldhouse at nearby Massilon High School. "It was another successful year," Chiera said. "For the fourth year in a row we qualified and earned a superior rating in the state of Ohio. And at the Bands of America Regional we placed second in our class. We're very proud of that." Assistant marching band director Dennis Oswald shares Chiera's sense of pride for the band and said he's especially looking forward to the Fiesta Bowl Parade. "It's going to be a great experience for the band members," Oswald said. "I believe this is a once-in-a-lifetime opportunity and I'm proud and excited to be here with them."